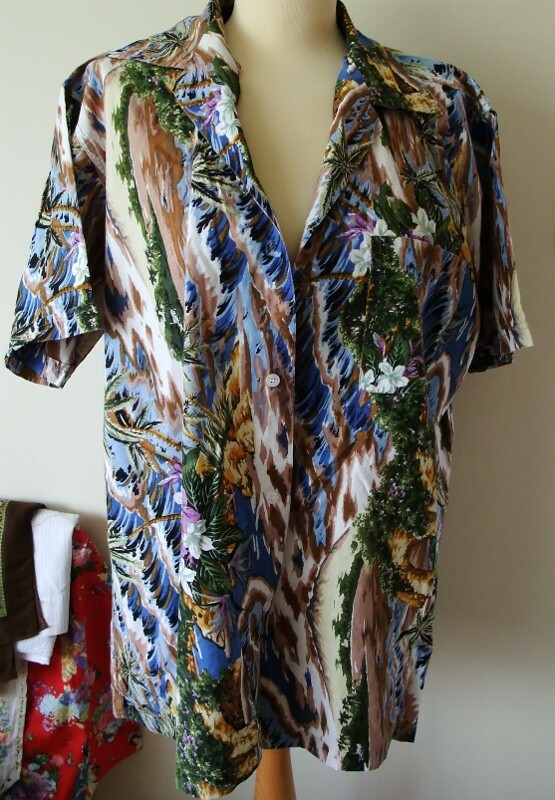 Never able to resist buying an "interesting" piece of textile - no matter that in this case it was in the form of a Hawaiian shirt with more than a few rips and tatters - this palm tree beach print had always suggested a South Pacific inspired outfit. Sadly there simply wasn't enough for the bathing suit which I wanted to make - it would have needed a contrasting textile to enable me to cut out the crotch and I felt that was an avant-garde effect I wasn't really after! 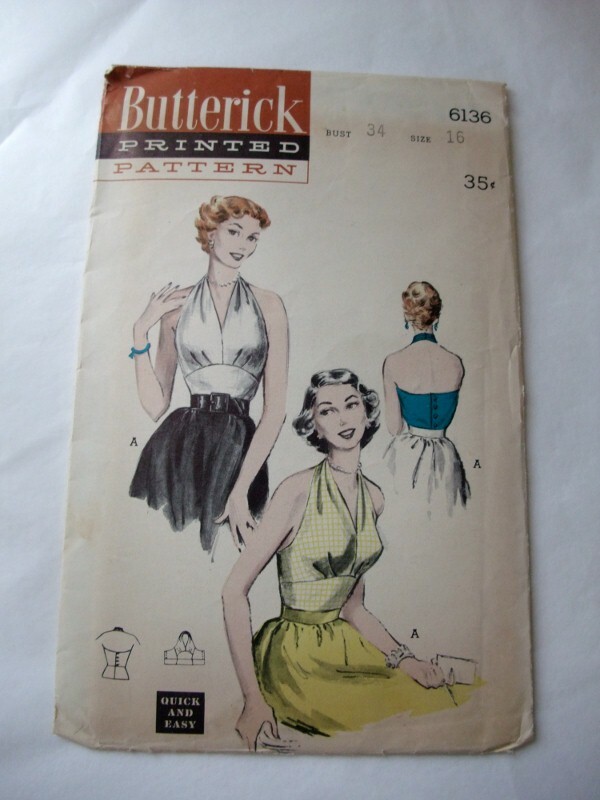 I had bought this lovely vintage 50s halter top pattern - Butterick 6136 - a while back and realised it would be just right for this project. The pattern needed some long bias strips to face the edges - and again, there wasn't enough textile to complete this. 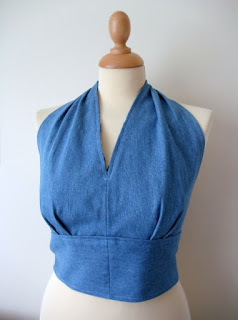 My solution was to make the halter completely reversible and use an old denim shirt I had kept since the 90s for the reverse. 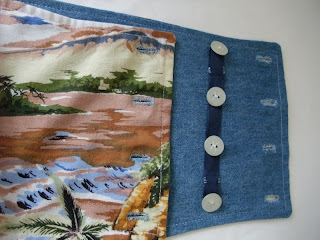 The halter fastens with buttons on the back and to solve the problem of button fastenings on both sides, I used a tip from one of my vintage 1940s needlecraft books. 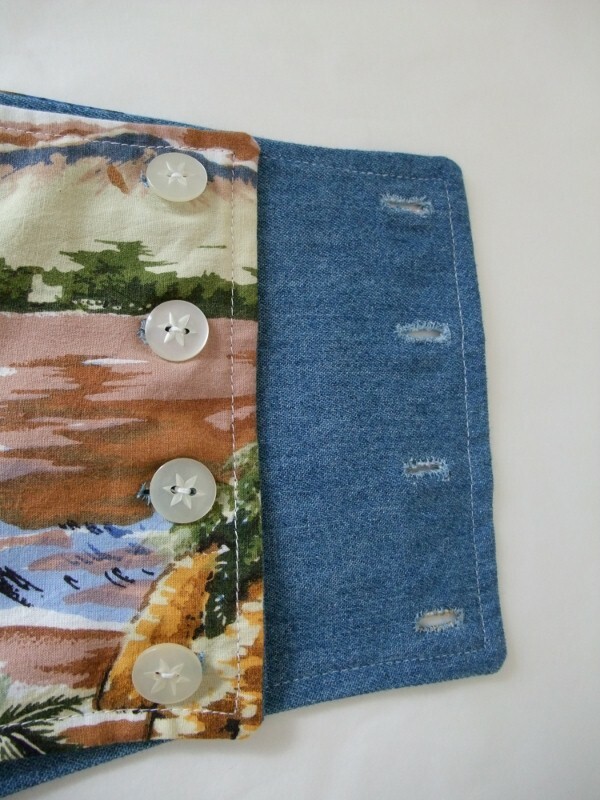 This 40s tome suggested working a set of buttonholes down both edges of a garment and then stitching the buttons onto a length of ribbon so that the buttons would fasten through both sets of buttonholes and could simply be moved to the other side. The original suggestion was to enable buttons to be removed easily before laundry back in those days when everything was so scarce. 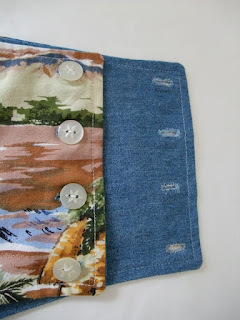 Although I didn't progress any further in the sewing competition I had entered, I was at least pleased that the expert judge told me she had never seen this method of button fastening before & she had learned something new. She was also impressed by the matching sandals I made which I will feature in another post. 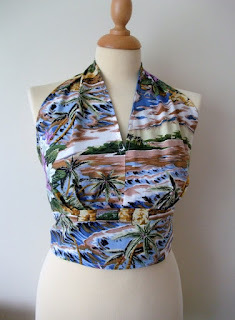 The halter is a bit on the small size for me (a vintage size 16 and 34" bust!!) but the pattern seems quite generous and also gives good coverage of the bust, plus the waist section is really cute, so I am going to try to size the pattern up so I can make it to wear. Below you can see photos showing a close up of the palm beach textile, illustrations of the button solution, the reverse denim halter and also the original "donor" garment. Hope you are all enjoying the bank holiday weekend, sunshine or not! It's really lovely, and so well done. I still can't figure out how you did the buttons. What is the name of this 40s tome you used? Hi, glad you like the halter. 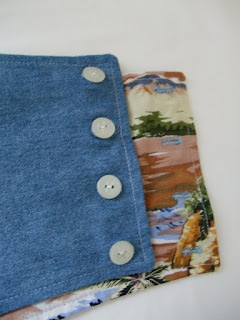 I think this was in the "Make Do & Mend" book but I must double check as I read so many! I'll put some more photos in separate post to try to explain buttons better. K.